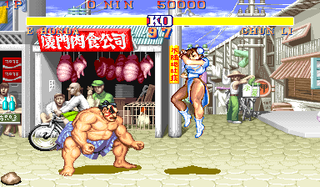 Street Fighter is a series of the genre 2D beat’em up. The original Street Fighter I was an arcade game receiving only little attention. Only the follower Street Fighter II was successful over several countries and became a well-known classic within a short time. Meanwhile, the series comprises dozens of titles, versions and editions. For most of the known computer systems and consoles one of the many spin-offs was released. The games series also served several times as model for anime and real movies. 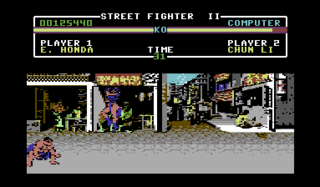 For the Commodore 64 there are two different version of Street Fighter I, which are the US and the European or UK versions. Partially both versions were sold together on one disk, or respectively cassette. The first page of the media contained the US version and the second the European conversion. The games were produced by different manufacturers and differ significantly in quality. Furthermore, the also known title Street Fighter II was converted. 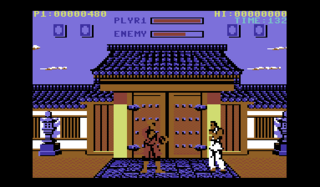 The C64 version of all three games are seen as more or less failed, both concerning the animations and the gameplay. The numerous other titles of this series, as e.g. 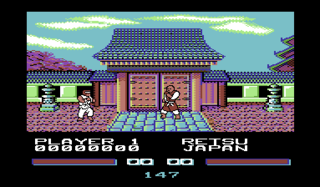 part III and IV, Turbo, Super or Champions Edition, were not converted for the Commodore 64. The vertically scrolling beat'em up Final Fight takes also place in the Street Fighter universe. 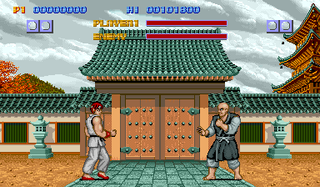 Here Ryu competes against Retsu in the first stage. Alone the graphical differences are significant. "Heap of pixels" vs. "detailled comic graphics"! Round One! Fight! This page was last modified on 7 December 2014, at 22:05.